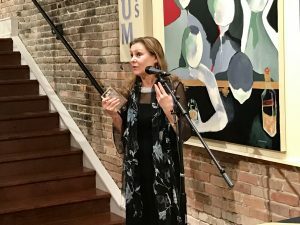 Tracey Varga, director of Forward Motion Dance Company, received an award in the 2018 Arts in Wilmington Award event held at Expo 216 in Wilmington on January 20, 2018. Tracey was recognized for her contribution to the Arts in Wilmington in the Individual category, and in receiving the award, she in turn recognized the importance of building relationships, collaboration and the wonderful support of so many in the Wilmington area who help bring dance, music and visual art together. Tracey is a choreographer and visionary who has been involved in Wilmington’s dance community for 20 years and has produced many dance performances, such as Arts Sensation and Cape Fear Arts in Motion, with Forward Motion Dance Company since 2001. Forward Motion Dance Company dancer Ashely Barnes, owner of the Dance Element and director of Element Productions in Wilmington, was also recognized with an award in the Artist category. Forward Motion Dance Company is proud of its representation at this year’s event and would like to thank Craig Stinson and all those involved in Arts in Wilmington by creating an avenue to connects artists, arts professionals, and arts advocates. Congratulations Tracey! You are so deserving of this. I am always amazed at the talent and vision you bring to your shows. Thanks for bringing all this to Wilmington. Hey Tracey. This is Kitty Yerkes. Hope you are well. I am,looking for someone to dance like a robot at a Cape Fear Museum event on March 21. Thoughts? My cell 910.619.9681. Hugs to you.